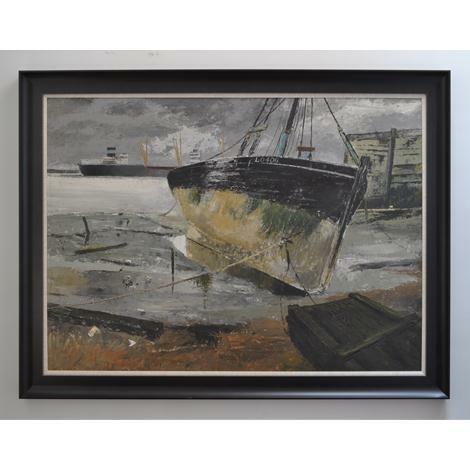 This large and impressive painting offers a marvellous image of the boat, anchored in the mud, at low tide - registration code LO406 - with scant hints of docks and barge behind to provide context. But what really commands attention is the vigorous handling of the paint. With palette knife and square brush, the colour is applied thickly, scratched through, scrubbed and rubbed so that the surface texture has a powerful presence. One is reminded that Pountney had visited St. Ives and made no secret of his admiration for the work of Ben Nicholson. The latter's cool, Non-Objective abstraction was often articulated with a painterly finish that revealed the hand of the artist in a curiously Romantic way.